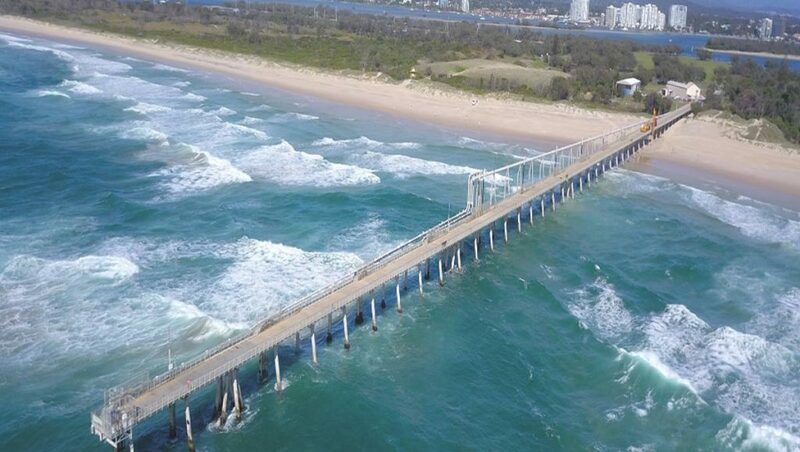 A 100-kilowatt solar power system will soon be installed for the Sand Bypass System at The Spit on Queensland’s Gold Coast. The Sand Bypass System shifts 500,000 cubic metres of sand from The Spit to South Stradbroke Island each year. 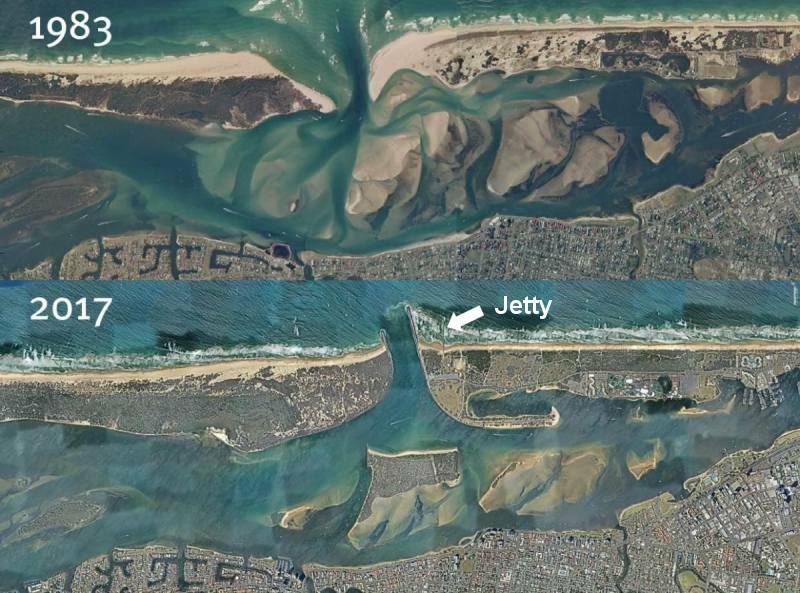 Removal of the sand facilitates safe transit between the Broadwater and the ocean for recreational and commercial vessels and improves water quality in the Broadwater through increased tidal exchange. According to the Gold Coast Waterway Authority, this has enhanced biodiversity in the area and also provided a greater capacity for flood relief. The following image shows how things looked in the area prior to the system being put in place in the 1980’s and then again in 2017. A 500 metre jetty with ten jet pumps used as part of the system is very hard to see in the 2017 image, so is indicated by the arrow. You can learn more about the history of the system and how it works here. 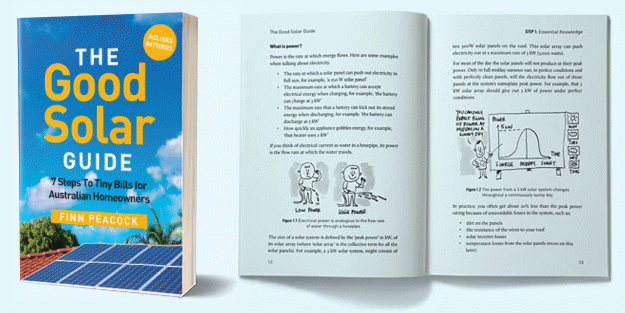 All that pumping requires a significant amount of energy, so it’s great solar power will be used to pitch in. According to the Queensland Government’s announcement, “1.5 megawatts of electricity” is needed when the sand bypass system is fully operational. That’s a little confusing – did it mean 1.5MW of power or 1.5 megawatt-hours of electricity (energy)1 – and if the latter, over what period? “This 100-kilowatt, solar-powered system will produce enough energy to meet the day-time needs of the Sand Bypass System, helping to reduce the annual electricity bill by $24,000,” said QLD Transport and Main Roads Minister Mark Bailey. A 100kW solar power system installed in that neck of the woods can be expected to generate around 450kWh a day, averaged over a year – that’s a fairly conservative estimate. So it’s possible a system of this size could provide the equivalent of daytime requirements based on 1.5MWh of electricity consumption a day; with a day involving 24 hours of operations. But there’s some heavy duty pumping hardware involved. Looking at a fact sheet for the sand bypass system, it notes 2 x 150kW low pressure pumps, 2 x 560kW high pressure pumps and a 710kW slurry pump. Digging around further, I found a tender document stating the sand bypass system consumes 2 GWh of electricity per annum – so around 5,479kWh a day. Minister Bailey may have been a little optimistic as to how much the solar power system will contribute, unless the facility runs at a greatly reduced level during daylight hours. Anyway, the addition of solar power is a very positive step. The Gold Coast Waterways Authority has awarded the contract to design, install and maintain the ground-mounted solar power system to SAE Group; which has been around the residential and commercial solar scene for quite a few years. SAE Group will start on construction next month, with view to completion by the end of June this year. The Gold Coast Waterways Authority says this pilot project will help determine potential solar electricity output for the area, how the system stands up to the coastal environment and the impact on the sand bypass system’s electricity demand profile. ‘We’ll then use this information to determine if the system can be expanded to further reduce our operating costs and our carbon footprint in future,” said the Authority’s CEO, Hal Morris. Previous Article: The Desert Knowledge Australia Solar Centre: Which Panels Are Winning In 2019?